BREAKING: Makerere VC hits vocal MUASA Chairman with suspension! 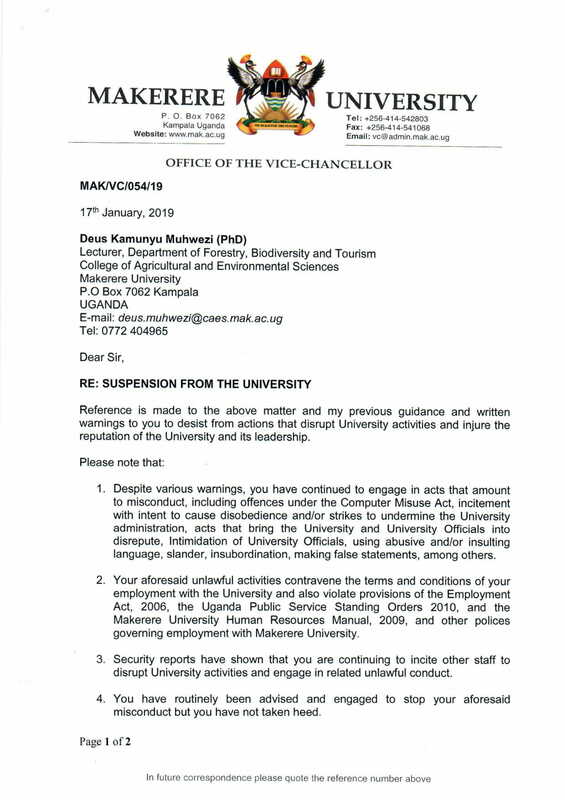 KAMPALA – Dr Deus Kamunyu Muhwezi، the outspoken chairman of Makerere University Academic Staff Association (MUASA), has been suspended with immediate effect for allegedly inciting staff to strike and undermining the university administration. In a letter dated 17th January, the University Vice-Chancellor, Prof Barnabas Nawangwe, says Dr Kamunyu has consistently ignored various warnings to desist from disobeying university guidelines. “Despite various, you have continued to engage in acts that amount to misconduct, including offences under the Computer Misuse Act, incitement with intent to cause disobedience and or strikes to undermine the university administration, acts that bring the university to disrepute, intimidation of university officials, using abusing language, slander, insubordination, making false statements, among others,” Prof Nawangwe’s letter to Dr Kamunyu reads in part. The Vice-Chancellor adds that despite being routinely advised to stop the alleged misconduct, Dr Kamunyu has not taken heed, hence the suspension. “Therefore, to protect the reputation of the university, I hereby suspend you from the university in accordance with Section 5.9 of the Makerere University Human Resource Manual. A committee will be constituted to investigate your said conduct and you will be invited to participate in the proceedings,” the suspension letter adds. 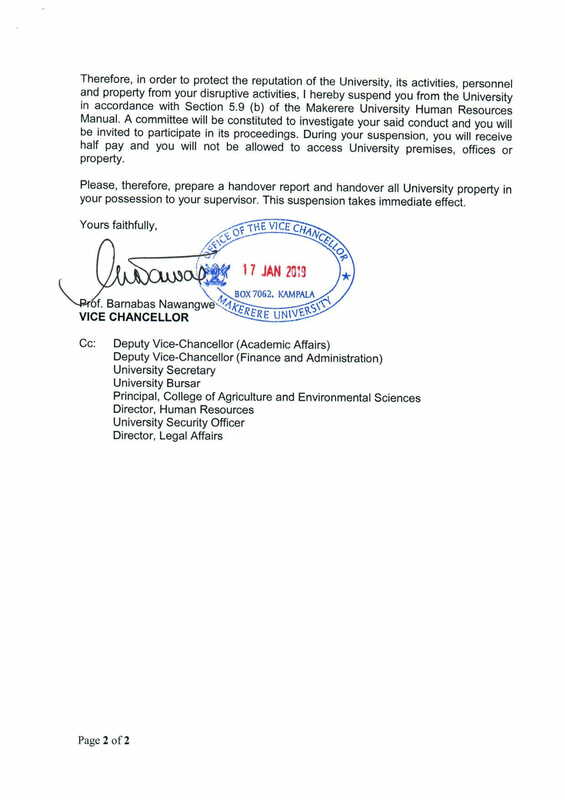 During suspension, Dr Kamunyu will receive half pay and will not be allowed access to the university premises, offices or property. He has been ordered to hand over the university property to his superior. Dr Kamunyu was not immediately available for a comment but his suspension is likely to rattle the academic staff who have been vocal in the demand for better pay and working conditions. Dr Kamunyu, who is a lecturer in the Department of Forestry in the College of Agricultural and Environmental Sciences, has been vocal in the demand for better remuneration of staff at the university. He has also spearheaded the fight against the University Council, opposing some of its decisions. For example late last year, vowed to fight the amended law that gives the university power to dismiss or terminate the contract of a university employee facing criminal offences. Dr Kamunyu described the act as unconstitutional and aimed at stifling on employee’s freedom of speech especially those speaking against unfair university policies. “I wonder why a knowledgeable council could pass such a careless law without consulting the legal department. Whatever was passed is against the provision of the constitution of Uganda so we are going to repeal it since Makerere is not above the law to pass such laws,” Dr Kamunyu said then. 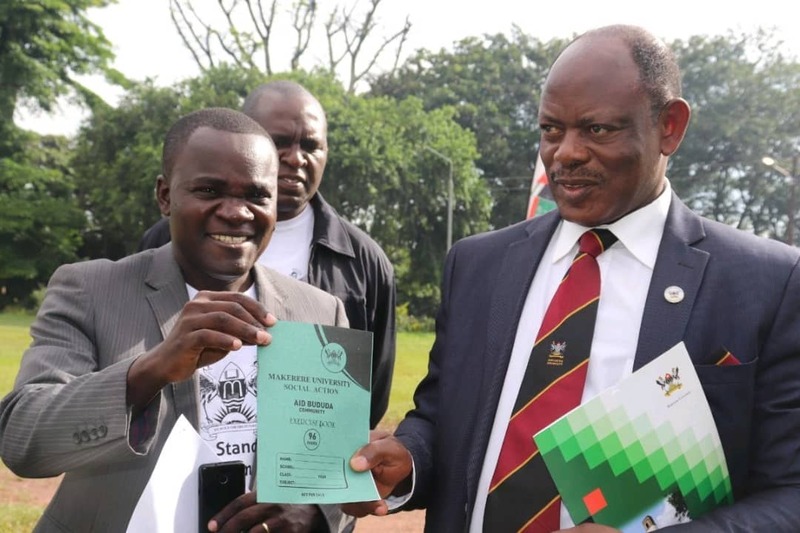 Prof Nawangwe’s decision also indicates his resolve to continue fighting what he described as impunity and indiscipline among staff at the university.